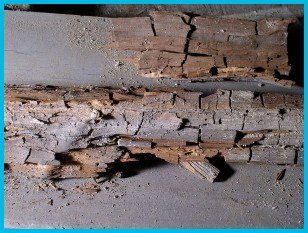 Dry rot is the term used to describe ‘brown rot decay’ which is caused by fungi that attack and damage the timber in buildings and other wooden structures. Whilst the name suggests this rot does not require moisture (damp), this is incorrect. 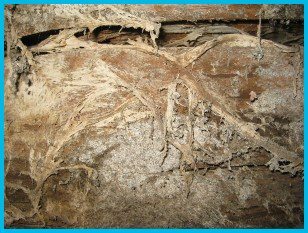 To ensure the type of rot is correctly identified, the type of fungus causing the problem needs to be confirmed to ensure it is not one linked to wet rot. Dry rot only affects woodwork that is damp, usually with a moisture content above 20%. It is critical that the source of moisture is removed alongside other treatments which will stop and remove the potential for future growth and property damage. The most common causes of damp include leaking appliances (e.g. washing machines), shower trays, baths and condensation build-up. Once the source of damp has been identified and removed, the affected timber is often removed and replaced with pre-treated wood to prevent re-infection. Other timbers in the area which are not replaced may also be treated with an appropriate fungicide. 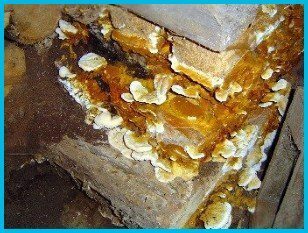 If the dry rot has passed through masonry, this should be isolated using physical barriers and/or sterilisation procedures. We are a comprehensive damp proofing company in Carlisle, Cumbria. Offering a complete damp proofing service including – damp proofing, timber treatment, plastering, building, joinery, electrics, plumbing, tiling, which enables us to take on any project big or small, making the job easier and less stress for you. our professional damp proofing team will carry out a survey before every job, an exact specification will be made for every individual situation. Davidson’s DPR get it right first time. At Davidsons DPR we specialise in building preservation & restorations with the highest quality finish, whether it’s the preservation of old or listed buildings, terraced or country cottage, barn conversion,or lodges churches and castles we offer the best remedial damp systems out there to solve all your problems and needs to bring your property back to life. Davidsons DPR – Get it right First Time.